When choosing a coaxial splitter to manage the distribution of cable transmission there are several options, depending on the individual project’s requirements. The Channel Vision Coaxial TAP Splitter is a 2-way solution that’s ideal for splitting a cable feed to a cable modem. This unit is unique among most cable TV splitters, as it reduces the dB level to a short run while maintaining a maximum dB level to the longer run. These units are available in various amounts of level reduction ranging from 6 dB to 24 dB. When routing video signal to several destinations, a piece of hardware like the Suttle Coaxial 4-Way Splitter may be required. This is a splitter module that’s used to distribute coaxial video signal to up to four outlets throughout a home or office location. It’s typically used with a video amplifier to increase the signal amplification for maximum quality. For installations requiring a weatherproof indoor/outdoor casing, Allen Tel offers a coaxial splitter with 1 input and 8 output connections. 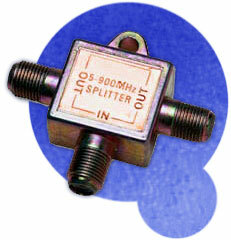 This particular splitter has a characteristic 11dB of insertion loss. Allen Tel also has a line of various other splitters ranging from the Mini 2-way version, 3 and 4-way models as well as a line of cable installation accessories for completing cable splitting projects such as grounding blocks, feed-thru bushings and cable clips. Whether a consumer’s simply interested in adding a cable modem with a 2-way splitter in the home or adding several television monitors to a restaurant/bar to attract sports fans as customers, there’s an ideal coaxial cable splitter available at www.TWAcomm.com.